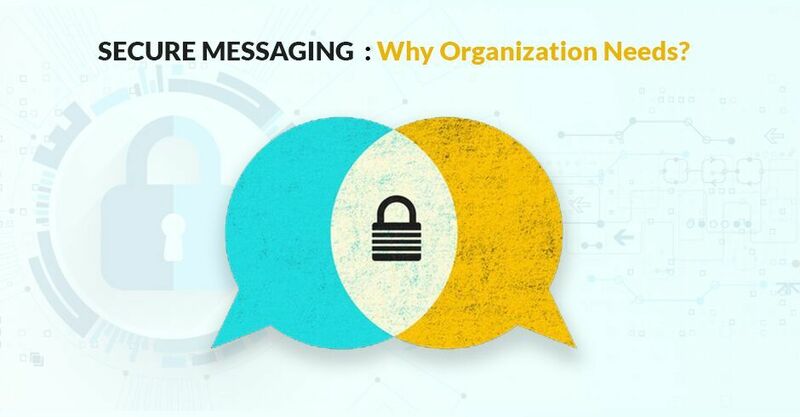 Secure Messaging: Why Organization Needs? blogs Secure Messaging: Why Organization Needs? It does not matter if you are a tech-savvy young individual who cares about his privacy or a professional with a business that holds secrets of values, secure messaging has already become a no-brainer for everyone. We all are using Facebook Messenger, WhatsApp, Skype, Google Hangouts, and even Instagram. But are they all SSL encrypted ? Businesses in today’s world are facing unprecedented risks. From financial transactions to private messaging, all have become vulnerable to disruption, and human error. Also, it is not something new how certain people intentionally want to destroy the game of others. Not so proud, but the communication mediums and the crisis are directly proportional to each other. Secure texting not only nurtures a strong collaborative environment but also enables the users to communicate and coordinate with co-workers seamlessly. It eliminates the need for multiple tedious communication platforms and several devices. if you want to convey a message an email might work well to an extent. if you have to describe the things manually to the person who is on the opposite side of the globe, you would need a video calling application. Likewise, you are in need of a separate channel for a different functionality. That was the moment when instant messengers have raised the bars for business to team up like never before. With just a single platform, any kind of information can be sent and received without having constant checking of the email inbox or constant login to a website. But, but security pops up with a “DON’T IGNORE ME!” look at who would want to risk an organization’s data when it is a cakewalk for the purpose of communicating. The major component of any messaging application should be end-to-end encryption. The messages should not be accessed by any third parties except the sender and the receiver. With the advancement of technology, it is hard to discover an application that would not encrypt your information. To secure the data of your organization, make sure of the protocol you are choosing. AES with 256 bits has more chances to keep you protected from almost all kinds of brute force attacks. There are messengers like Skype and Google Hangouts which store encryption keys in their own servers; which significantly means that anyone who has the access to the servers can peep into your account and would be able to read your every single message. Therefore, choose an encrypted messaging software which enables you to set up your own server. Make sure the ball to be in your court, i.e., have the control that you have access to the database. Against a backdrop of only increasing digital risks, it is your responsibility to prioritize cybersecurity within the workplace. There are just a few blurry lines between personal and business communication that are obscuring at an increasing rate, which means that unsecure application comes with huge risks and become rife within companies. With the practice of allowing the employees of an organization to use their own systems, laptops, mobiles (BYOD) it is impartial that one must be able to manage their personal information private. That’s why end-to-end encryption is crucial for enterprises and employees to protect their assets. With secure messaging, it is assured that the data is protected to the maximum. I admit that there are certain situations where I have sent sensitive information to the wrong people or window or times we do not anyone to see the messaging history. Bro, It was not less than embarrassing. Even if it has an end-to-encryption, make sure whether you have the amount of control on deletion. Message deletion is a nifty component in an application to clean up your history or to eradicate something unwanted behind. So be careful of what you say prior to saving yourself from either getting fired or becoming the reason for laughter. We have all studied that metadata is simply data about data. Well, the majority of the secure instant messaging apps store metadata about your messages. Surprised, eh? Ummm, me too. i.e., the information other than the actual message such as the sender, receiver, time, device information etcetera. It gives a Kohinoor’s (am I exaggerating? Never mind) worth of information to hackers when they are not able to bypass the messaging encryption. Hence, it is advisable to see what kind of information they are seeking from you before you hit the “agree” or “accept. Regardless of how secure an application is broadcasted to be, if you do not pay attention to it, have to say that you are digging your own grave. You can never be sure of what is lying behind the super flashy, smooth user interface. With the implementation of GDPR and several other government agencies and tech firms maintaining a track record of cooperation with third-party agencies, the only way to know about the transparency is to talk with the developers. In software terminology, openness or transparency refers to open-source where the source of the applications is visible for everyone who is in use. End of the day, you need to understand that the security does not come at the cost of productivity. Using a securing messaging communication tool need not mean sacrificing essential functionalities such as screen sharing, video calls, or securing files. Thank the gods, we have now multiple solutions that come with security benefits as well as expected features that usually businesses rely on. Over to you, now. Analyze these guidelines and determine how secure you are what application to choose for your further conversations and conversions. Share with us in the comments section below what applications have you chosen.